This image from West Park Asylum is actually two images stitched together, although they weren’t shot as a panorama at the time. The first photo included the window, wheelchair and part of the corridor, but it was missing the Mickey Mouse and Donald Duck murals which were set slightly behind me. After reviewing this initial shot on the back of the camera, I felt that the composition would work better if I stepped back to include the Disney murals. However, when checking both shots on the computer at home, it seemed to me that neither was right, as the wheelchair was too far away in the second shot, but the first one was less strong without the mural on the right. Today (some time after the original photos were taken), I had another look and realised I could probably merge the two shots together to get the best from both images. This was surprisingly easy using masks in Photoshop, and even though both shots were taken from different distances I was pleased to be able to blend them seamlessly into one panoramic shot. 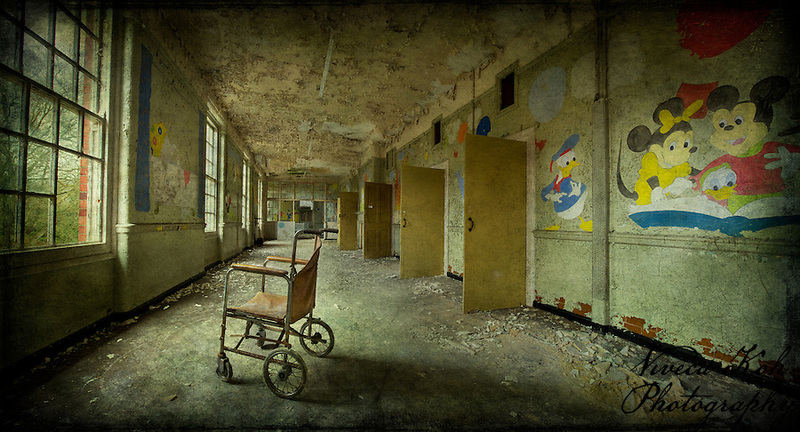 I hope this goes some way towards capturing the poignancy of the children’s ward at the asylum. This entry was posted on Wednesday, September 14th, 2011 at 22:02. It is filed under Asylums, Urban Exploration and tagged with abandoned, Asylum, panorama, texture, Textures, UE, Urban Exploration, UrbEx, West Park. You can follow any responses to this entry through the RSS 2.0 feed. West Park and Hellingly were two places I always regret never actually managing to get to… The atmosphere there just from the photos looks amazing. You’ve certainly been to some fantastic places, and captured some awesome images too. West Park was actually the first UrbEx location I ever went to, and has always been one of my favourites – I consider myself very lucky to have seen it when I did. Hellingly was wonderful too. Thanks for the compliment! Thanks Felix, and all my other friends who have commented here – sincere apologies for tardy response, have been away from computer for a while. I really appreciate all of your feedback. Only discovered your work today and have been looking at a lot of images. This one haunts the most. The very idea of children being kept at such a place is quite horrific and when you add the Disney characters somehow it just gets worse. Wow, Viveca, once again you’ve really created a masterpiece! A highly dramatic and emotional piece here, very well seen and executed my good friend! I love how your creations are so much more than a photograph, they really are a glimpse into some pretty important and evocative historical events. Your work is amazing. This image is absolutely exquisite. You did an incredible job in stitching the 2 photos together. The depth of the image is incredible. Love it. The empty wheelchair stirs up so many emotions. Very powerful shot.